We know you have choices for your pain management in Johnson County KS, but we also know that other options are often able to give you real solutions for your pain. Most of the time pain is addressed with prescription drugs and an option of physical therapy/rehab therapy. The addition of physical therapy to the all too common prescription drug option is a step in the right direction, but still falls short of a pain solution. 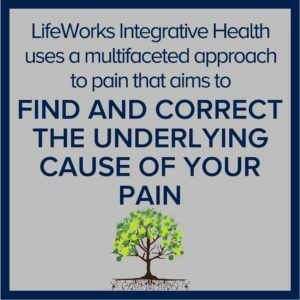 The team at LifeWorks Integrative Health has answers to pain that correct the source of the pain, rather than just covering it up with medications. In the realm of pain management, we have found a big cover up taking place. The whole pain management industry is focused on covering up your pain. This “cover up” actually takes on two forms. The first is using prescription drugs like anti-inflammatory drugs and opioid based pain drugs to cover up the pain so you can function. However, covering up pain, is not a long term solution and often creates long term negative effects. The second “cover up” is the devastating effects these medications are taking on Americans in the form of addiction. The opioid crisis is not off in a distant land. It is right here, and it affects all ages, all demographics, all ethnicities, and all socioeconomic statuses. It affects you and no one is immune to the risk of addiction to opioid medications, even when used as prescribed. Relying only on medications to address pain, even with the addition of physical therapy is never going to solve your pain and will only put you at further risk. Musculoskeletal pain usually comes from tight and weak muscles that leave your joints, ligaments, and tendons susceptible to injury. This tightness and weakness comes from improper, repetitive movements. These improper movements have become the regular daily activities for most people due to increased sitting at desks, looking down at electronic devices, and decrease in physical activity. Not to mention poor food quality, high stress levels and inadequate sleep all which further compromised your resiliency. The solution to your pain is the combination of correcting the improper movements, aligning the spine, and strengthening/lengthening the weak, tight muscles. The risk of relying on medications to address pain is high- incredibly high- as evidenced by the skyrocketing rates of opioid drug abuse from people with legitimate pain who obtain medications through appropriate, legal, medical means- their doctor. 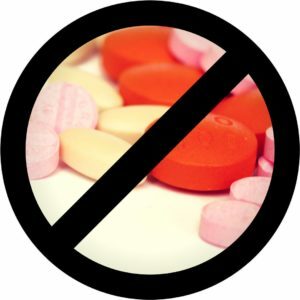 80% of opioid addictions originate from a legitimate prescription for pain medication. Research is continuing to uncover that the effects of opioids is not just limited to the source of the pain. Studies show that long term opioid use leads to poor quality of life all around. This includes higher rates of mental illness which is subsequently skyrocketing in the US as well. When it comes to general low back pain as well as herniated discs, sciatica, degenerative discs, and other pain related musculoskeletal issues, chiropractic care is not just low risk, but it also reduced the risk factors for other diseases. Chiropractic care, physical therapy/rehab, and regenerative stem cell therapy are not only safe alternatives to opioids but they actually aid in improving quality of life instead of leading you down a spiral of addiction risk, mental illnesses and lower quality of life. Main management in Johnson County KS does not have to include more pain and the high risk of a substance addiction. LifeWorks Integrative Health uses a multifaceted approach to pain that aims to find and correct the underlying cause of your pain. Even if your pain is from an old injury or failed surgery, we have multiple ways in which we can get you out of pain and keep it that way. Too many people wait too long for safer, more effective pain options, and that needs to change. Through a comprehensive physical assessment, understanding your story, and developing a combination of treatment options that fit your specific needs, we can work together to get you the health you need for the life you want. Don’t wait to get out of pain. We have found in over 15 years of experience with pain that the most effective solution for most people is the combination of chiropractic care and rehab therapy. Within our comprehensive chiropractic and rehab therapy team, we also utilize trigger point therapy to provide you with quick relief. Our approach to chiropractic care is both corrective and preventative. We assess the curvature of your spine to determine where imbalances are contributing to your pain, and begin to correct the damage done from years of improper, repetitive movements. We don’t stop there though. Simply aligning your spine and sending you home is still a shortcut, and we don’t do shortcuts. The proper alignment of your spine is crucial to good health not only for pain, but for optimal functioning of your central nervous system. Strengthening the muscles that keep your spine aligned is just as important as proper alignment. This is why we have such a high value for rehab therapy to strengthen and stretch the muscles that have become tight and weak over time. In the case of degenerative pain, pain from old injuries, and failed surgeries we assess if you are a candidate for stem cell regenerative therapy which promotes new healthy tissue in injured areas. Learn more about our regenerative medicine options here . Most people only address pain from one angle- dangerous pain medications that actually end up doing very little to relieve pain long term. We are different. We have safer and more effective pain solution options waiting for you. Our highly skilled, compassionate, and experience team is ready to help you feel great again. We are your right choice for pain management in Johnson County KS.